“To introduce a saint is a big job, but to film an angel is something else entirely,” said Academy Award-nominee Sharon Stone upon presenting Amma with the ‘Prix Cinéma Vérité 2007’ Award in Paris. By “filming an angel,” Stone was referring to the 2005 Jan Kounen documentary about Amma, Darshan. On behalf of Cinema Verite, Stone then presented Amma with a silver necklace and locket. Cinema Verite is a French film organization focused on creating awareness regarding human-rights issues. 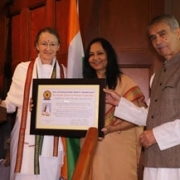 The organization was honouring Amma in acknowledgment of her role as a force for world peace and harmony. After bestowing the award, Cinema Verite requested Amma to share her thoughts about the current state of the world, with particular focus on the increasing incidents of war and natural disasters. “There verily is no one more qualified to speak about peace than Amma. Not only is her life lived in peace, it awakens peace,” said Manuel de la Roche, the producer of Darshan, just prior to Amma’s speech.